Nikki Haley resigned Tuesday as the Trump administration’s ambassador to the United Nations. The announcement shocked White House staff and fueled conjecture that she had bigger political ambitions in mind. “No, I’m not running for 2020,” she told reporters at the Oval Office, preempting questions about her interest in the presidency. “As a private citizen, I look forward to supporting your reelection,” she reassured Trump in her resignation letter. Whatever she does, Haley has spent 19 months cultivating an image as the lone Cabinet member who transcended the chaos around her. She has remained insulated from the president’s unpopularity, receiving a 63 percent approval rating in a Quinnipiac University poll in April, and even publicly contradicted some of Trump’s stances on Russia and Syria, casting herself as an independent among sycophants and isolationists. But Haley, a first-generation Indian-American, has also come to symbolize the Republican Party’s doomed flirtation with racial inclusiveness. The GOP once saw multiracial coalition-building as key to its survival, but bet its future on full-throated white identity politics instead. Haley’s journey mirrors the path of a conservative movement that gave itself good advice but chose to ignore it. Quiet as it’s kept, the GOP showed an earnest interest in becoming less white as recently as five years ago. After the 2012 presidential election, the Republican National Committee commissioned an autopsy titled the “Growth and Opportunity Project,” which sought to “provide an honest review” of Mitt Romney’s loss to President Barack Obama that November. The 2013 report suggested a path forward focused on nonwhite voters. Haley became an emblem of these efforts. Since her Republican primary win in the 2010 South Carolina governor’s race, the telegenic former state legislator had drawn comparisons to Obama and stoked speculation that she might be president by 2020. In 2012, she was floated as a possible running mate for Romney. And during an October 2014 debate for her gubernatorial reelection campaign, she projected an appealingly sunny outlook on southern race relations, dismissing her Democratic opponent’s calls to remove the Confederate flag from the statehouse grounds. “What I can tell you is over the last three and a half years, I spent a lot of my days on the phones with CEOs and recruiting jobs to this state,” Haley said. “I can honestly say I have not had one conversation with a single CEO about the Confederate flag. “We … fixed all that when you elected the first Indian-American female governor,” she added. Haley’s verdict did not age well. Eight months later, Dylann Roof walked into Emanuel African Methodist Episcopal Church in Charleston and murdered nine black parishioners. The Confederate flag was one of several white supremacist emblems he had brandished in self-portraits on his website leading up to the attack. Haley quickly became a leading voice advocating for the flag’s removal, and shepherded the process to fruition. In retrospect, this moment granted the GOP a thin sheen of plausible deniability. The party of the Southern Strategy, “welfare queen” rhetoric, a nearly 90 percent white base, and an often flagrantly anti-black tea party–led backlash against Obama would likely not convince skeptics of its non-racist bona fides by removing the Confederate flag alone. 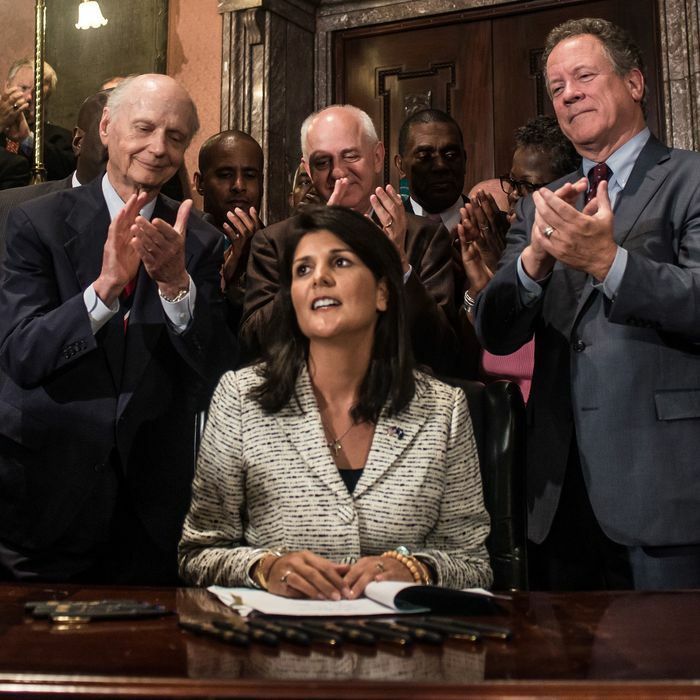 But to have Haley — a nonwhite Republican governor — preside over what looked like a banner moment of racial reconciliation seemed to unambiguously advance the party’s Growth and Opportunity Project goals outlined post-2012. The GOP Establishment fell in line behind him. Haley put up nominal resistance at first, saying she was “not a fan” and describing the then-candidate as “everything a governor doesn’t want in a president” ahead of the South Carolina Republican primary. “I want someone who is going to hold Republicans accountable, and I want someone who is going to make a difference, not just for our party but for every person they represent in the country,” she told reporters at the time. But by the end of that year, Haley had a job offer from Trump, and in January 2017 was sworn in as his ambassador to the U.N., making her one of the first Cabinet members to join an administration whose commitment to a thinly veiled white nationalist agenda had become widely understood. She was quickly cast as a “freelancer” by pundits, someone whose aims often “[didn’t] seem to be linked to administration policy,” according to one former senior official at the U.S. mission to the U.N., speaking to Vox. Observers cited her early condemnation of Russia’s annexation of Crimea as a point of divergence from Trump, who appeared committed to a warm ties with Russian president Vladmir Putin. Haley’s outspokenness on this issue and others, such as U.S. military strikes in Syria, reportedly prompted the State Department, then headed by Rex Tillerson, to ask her to make sure her public comments were cleared with Washington before she made them. Regardless, Haley was equally zealous in advancing Trump’s agenda as she was in circumnavigating it. In December, she went so far as to threaten U.N. General Assembly members for not backing the administration’s decision to formally recognize Jerusalem as the capital of Israel. “We will take note of each and every vote on this issue,” she wrote in a letter to 180 U.N. ambassadors. Haley defended Trump’s Muslim ban by insisting it wasn’t one, claiming she would “never support” such a measure — even as Rudy Giuliani said the president had approached him seeking ways to institute a Muslim ban and “the right way to do it legally.” She praised Trump in a September op-ed for the Washington Post, writing, “I enthusiastically support most of its decisions and the direction it is taking the country.” The fact that it is hard to know what decisions she dissented from is telling. She’s presented herself as a staunch Trump ally in public even while claiming she privately disagreed with him at times. It’s easy to think Haley has come a strikingly long way in the past five years — from symbolizing Republicans’ calls to bring more nonwhite voters into the fold to becoming an avid surrogate for an administration that is cementing her party’s descent into white-supremacist grievance politics. But her journey is typical of the Republican Establishment. She saw her party’s fortunes changing and cast her lot accordingly. At this point, what might have been is irrelevant. The choice is as much her legacy as it is theirs.